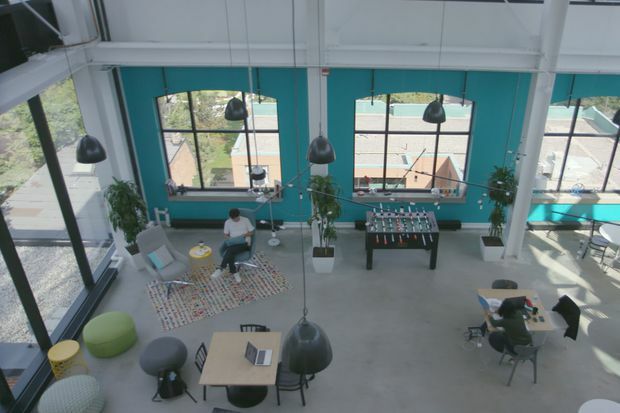 Co-working spaces, like this one in downtown Toronto at 180 John Street, give businesses a cost-effective and flexible alternative to traditional offices. Co-working has come a long way from this stereotype: would-be entrepreneurs hunkered down in shared office space because they outgrew their spot at the local coffee shop. Today co-working is big business for real estate owners, operators and tenants alike. Its wide range of benefits – including flexibility, a sense of community and networking – is starting to attract larger, Fortune 500-type companies, says Scott Addison, Colliers International’s president of brokerage services for Canada. “My image was the start-up or small sales force that was hardly ever in the office, but that’s not who is occupying co-working space,” Mr. Addison says. Colliers, a global real estate services and investment management company, has turned its focus to helping the once-niche office format grow even larger. In fact, Colliers is funding a Proptech Accelerator to identify and nurture companies whose technology can make commercial real estate more efficient. The worldwide competition launched this past year. In Sept. 2018, ten winners from seven countries convened in Toronto to begin the program. Each team will work to refine their business model, raise money and prepare a pitch for Demo Day. Upsuite is one of the companies enrolled in the accelerator program. Led by founder and CEO Ben Wright, the company aims to bring co-working users and real estate stakeholders together. Because real-estate brokerage firms and office landlords have traditionally focused on long-term office leases, they aren’t structured to lease out small spaces for short periods. This gap has created an opportunity for firms like Upsuite. The Denver- and Toronto-based company provides up-to-date listings for all available co-working spaces, along with details on features and amenities. Using proprietary algorithms, Upsuite is able to match teams with the best available co-working office to meet their unique needs. “Upsuite takes the guesswork out of choosing the right location, operator and amenity package,” says Mr. Wright. In real estate markets like Toronto, the co-working explosion has necessitated the need for specialist providers like Upsuite, says Mr. Addison. So what’s driving the co-working trend? According to Mr. Addison, it’s the changing nature of business and the tight market for traditional real estate space. He says major employers are hiring more contract workers in fields such as technology, consulting and communications. Even large tenants, such as the big banks and government, are using co-working space for teams that have been created to carry out a specific project or land a major deal. Upsuite currently serves teams of two to 20 people, which can comprise an entire enterprise or a unit of a larger company. Mr. Wright views the relationship between Colliers and Upsuite as complementary. He says Upsuite can play a role of specialist, allowing Colliers to focus on the larger real estate leasing requirements of its client base. The startup can also provide key co-working data and recommendations to Colliers brokers. Meanwhile, Colliers can refer smaller or complex co-working requirements to Upsuite as required. Some projections have the co-working sector growing to as much as 20 per cent of the office real estate in certain markets, Mr. Addison says. This number underscores the need to make leasing space easier for clients. Specialists like Upsuite can help deliver this efficiency to clients by giving suitable co-working space matches to clients in real-time. This content was produced by The Globe and Mail’s Globe Content Studio, in consultation with an advertiser. The Globe’s editorial department was not involved in its creation.